"We always knew they were coming back." Today we celebrate our independence! 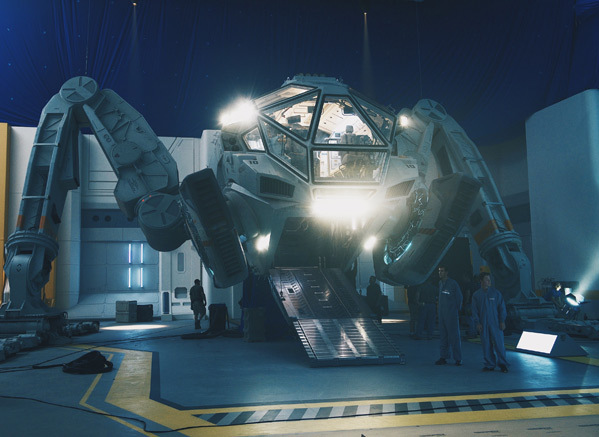 20th Century Fox hosted a major event on the set of the new Independence Day movie filming in Albuquerque, New Mexico at this very moment. Not only did they invite half of the film press down to the event, complete with fireworks and a screening of the original movie, but they live-streamed a Q&A with the cast. One of the big announcements was the title and logo (seen above) - it's officially called Independence Day Resurgence, which is a very lengthy title. Resurgence simply means that there is going to be an angry retaliation from the aliens, they're definitely coming back and they're going to be pissed off. So what do we have to defend ourselves this time? Independence Day Resurgence IS set on Independence Day. Emmerich: "But of course. Why else would it be called Independence Day?" Independence Day 2 is being once again directed by Roland Emmerich. As for returning cast members – Jeff Goldblum, Vivica A. Fox, Brent Spiner and recently confirmed Bill Pullman and Judd Hirsch will all be back as their characters from the first film. William Fichtner and Maika Monroe are new additions. The sequel is supposed to take place 20 years after the events of the first film, which will be real time, almost to the day, from when the original was released. Emmerich is directing again with a script that he co-wrote with Dean Devlin and James Vanderbilt. 20th Century Fox currently has Independence Day 2 scheduled to land in theaters on June 24th, 2016 next summer. Filming is now underway. Stay tuned for more updates. Where is the AntiVirus pod on that ship ? Oh no i never talk to scientists haha. That is probably why Roland's movies are just so much fun. Indefendance Day To! Looking forward to it. According to IMDB, he is! He was sorely missed by me in Skyfall, and I was so disappointing to learn he's not coming back for Spectre. I'm guessing his soundtrack for IDR will be great!